It was a bit of a slow day at Luce as well, so we were lucky to get lots of personalized attention from our friendly server. We perused the extensive lunch menu and it all sounded so delicious I had trouble deciding! The entrees in the Gran Piastre section of the menu include your choice of soup or salad. I ordered the zuppa di zucca, a simply fabulous light soup made of butternut squash and pumpkin with spinach, pancetta and a touch of cream. My dining companion had the caprese salad which not only was delicious (according to him, I didn’t force him to let me try it), but was a true work of art! 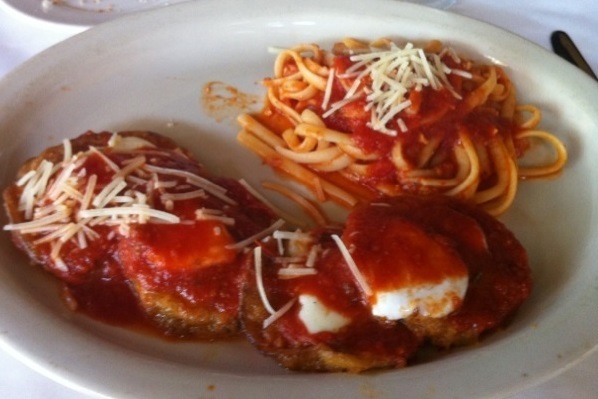 For the entree, I ordered the Melanzane alla Parmigiana (baked eggplant parmesan). I recently had a very bad experience with my own homemade eggplant parmesan, so I really needed to have my faith in the dish restored. This did it! The eggplant was expertly prepared. The dish came with a side of pasta, which was good, but a little strong in the garlic department. Usually, I wouldn’t mind, but I did have to go back to work! 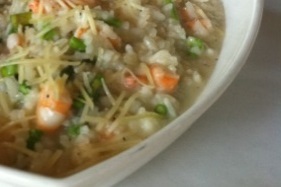 My colleague had the Risotto di Gambero e Asparagi. Unlike with his salad, I did indeed force my friend to let me taste his meal. It was so yummy I could have eaten the whole thing! We passed on dessert given we had to go back to work and couldn’t fall into a food coma before day’s end. J adores Italian food as much as I do and it looks like Luce would also make for a nice romantic evening 😉 We’ll be back soon for date night! I love meeting the owner – thanks for chatting with us Joe! Cute place, delicious food, friendly service. What more can you ask for? This entry was posted in Good Stuff! (Score of 6 - 8), Italian and tagged caprese, eggplant, italian, luce, soup. Bookmark the permalink. 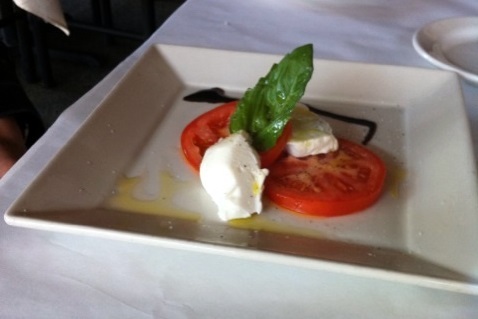 Just “found” your blog on Urbanspoon! FYI, today Luce is offering a Groupon ($10 gets you $20 for lunch and $15 gets $30 for dinner) AND they have an incredible happy hour special that features half price pizzas and apps and $4 glasses of vino from 4:30-6:30 (but of course, the half price starters cannot be applied to the Groupon voucher). I plan to give their egglpant a try (is it heavily breaded? )….about MANY other tasty-sounding items! (I think they have spumoni…it’s been TOOOO long since my tummy has tasted that treat!). Speaking of tantalizing temptations, FYI… a dynamic duo, Jeremy and Anne (both former Keller-ites, having trained/worked at the French Laundry), have been baking and selling PHENOMENAL delights at the Quarry Market (under the moniker Bakery Lorraine) on Sunday mornings. HALLELUJAH! They will be opening a bricks n’ mortar bakery on Grayson (near the Pearl Brewery) in September (exact date tba). I believe that Anne’s local past pastry chef stints include Il Sogno, Restaurant Gwendolyn and The Monterrey (and I recently read that Bakery Lorraine provides the pastries for Tre Trattoria’s Sunday brunch). I have trekked out to the Quarry Market a few times with the sole purpose of purchasing their weekly wonders (they post their “for sale” menu on Fridays on their facebook page and website…I think they also now have an Urbanspoon spot for their store front). The store will be open T-Sunday from the early morning (7am, maybe?) until the early evening (6pm). Anne is known for her magical macaroons (and just about anything else that she and her wonder twin, Jeremy, whip up!). I have thoroughly enjoyed reading your reviews. As a fellow-new-San-Antonio-ite (we’ve been here since July 2011), I truly appreciate your feedback (couldn’t resist the pathetic pun, sorry)! Hi Gretchen — Thanks for the recommendations! I had not heard of the bakery until now. Will definitely give it a try! I love the Luce happy hour.. and to answer your question about the eggplant, I didn’t find it heavily breaded but it was a bit garlicky. Keep the comments coming!